Chin Man Can (or Kan) is in jail on charges of being an illegal immigrant. The young man says he is nothing of the sort, but unable to prove that he was born in San Francisco because all of his belongings were destroyed in the 1906 earthquake. Can says that when he was 13, the rest of his family left San Francisco to return to China, but that he stayed behind, attending Chinese school and learning English. After the earthquake, he came to Los Angeles, where he was arrested while working at an Ocean Park restaurant. 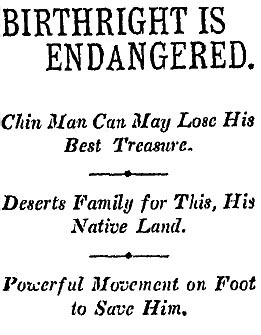 The Times defended Can, noting that his uncle was a wealthy San Francisco businessman, Ching Wing. “Ching Wing has always been so enthusiastic an American that he has arranged to bring up his baby as an American boy, forsaking the language of his fathers, wearing American clothes, reading American books. It seems like a joke that one of his relatives should be arrested,” The Times says. Although an inspector bolstered claims that Can had been smuggled into the country, testifying that he had frequently seen Can in Ensenada, a benefactor charged that the “Mexican ranger” was railroading Can to get the $300 bounty for turning in an illegal immigrant. 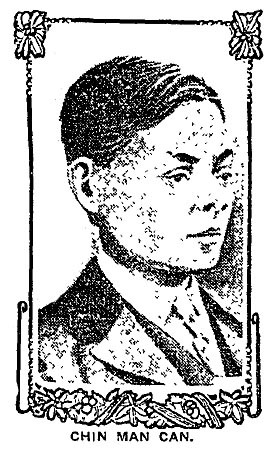 In 1913, while out on bail as his case was being appealed, Can was charged with belonging to a ring smuggling Chinese across the border. By then he was manager of the Quang Hing Lung Co. at 305 Marchessault St., and attending the University of Southern California. 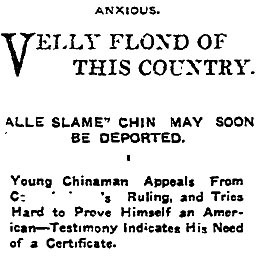 His trial lasted into 1914 and testimony revealed that Can had adopted the names Frank Chan and W.H. Chan. He was convicted of trying to smuggle a boxcar of immigrants into the U.S. and although he appealed his case, no further information can be found in The Times. This entry was posted in 1907, 1914, Black Dahlia, Books and Authors, Education, Immigration, LAPD, Streetcars. Bookmark the permalink.